Our second App for the Fitbit Ionic & Versa Smartwatches. 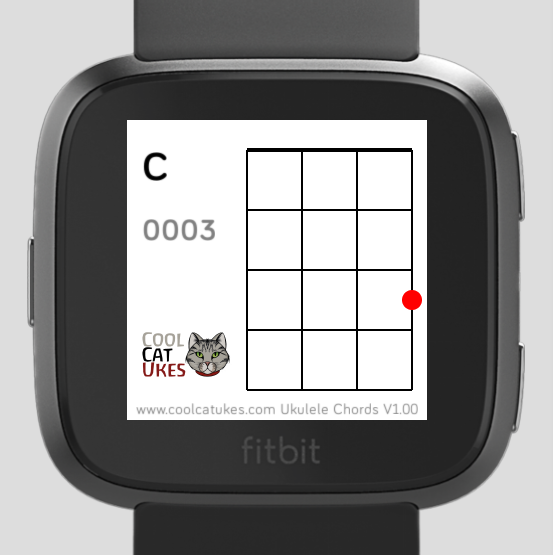 Taking our chord charts, and putting them on your wrist for handy reference. Step through chords in the same note by tapping the note on the top left, or step through to other notes by tapping the grid. Fancy inversions are accessed using the 'up' button, and some 'special' chords by the 'down' button. If you use the app and there are extra chords you think I should add (or spot any errors), please let me know. The app is available via this link, browse using the phone that's connected to your watch to load it. Handy, a reference book on your wrist.